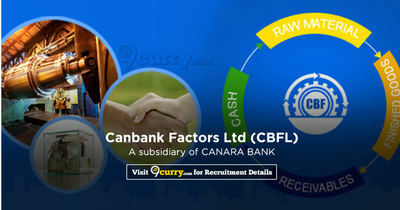 Canbank Factors Ltd Recruitment 2019 - Below are various recruitment notifications published by Canbank Factors Ltd (CBFL) / www.canbankfactors.com. As of now, we don't have any active recruitment notification by Canbank Factors Ltd featured here. We may update as soon as the organization announces a new job notification. If you are looking for any information related to previously organized recruitment drives by Canbank Factors Ltd, you can browse through previous job notifications mentioned below and get the new updates or information you are looking for. Canbank Factors Ltd Recruitment 2019 - Job notification for Legal Officer Post in Canbank Factors Ltd, Bengaluru, Karnataka on Contract Basis. Applications are invited by Canbank Factors Ltd (CBFL) on or before 16 Feb 2019 for 1 vacancy. Pay the Examination Fee through DD is to be drawn favoring "Canbank Factors Ltd" drawn on Bengaluru. He/ She should be a graduate in Law (i.e. LLB/LLM) with minimum 55% of marks (50% for SC/ST candidates) with computer knowledge. Eligible candidates may send their application in prescribed format (attached below) to The Executive Vice President Canbank Factors Ltd No.67/1, Kanakapura Main Road (Near Lalbagh West Gate) Basavanagudi BENGALURU - 560 004 on or before 16 Feb 2019 05:30 PM, along with copies of all relevant documents & certificates, Duly super scribing "Application for the post of Legal Officer on Contract Basis" on the envelope / cover and application received after the above date/time will not be accepted/ entertained.